Hill Road, Manurewa. Car Park/Public Toilets/Cafe. Open Daily 8.00 am - 6.00 p.m. The Gardens cover 64 hectares, which includes 10 hectares of native forest. A free guided walk is available every Wednesday at 1.00 p.m., meeting at the Visitor Centre. The Potter Children's Garden has a maze and interactive walled garden. 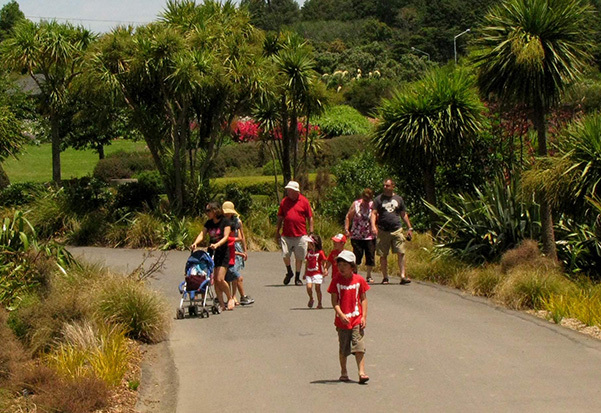 Longer walks are available from the Botanic Gardens, Puhinui Stream Forest Trail. There are native bush walks in Totara Park which are a good example of the rich variety of vegetation that once covered the Manukau region.